This post is part of my series on Wes Morriston's discussions of theistic morality. For an index, see here. 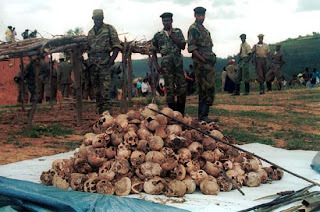 I am currently working my way through an article entitled "Did God Command Genocide? A Challenge to the Biblical Inerrantist". In Part 1, I sketched the broad outline of Morriston's argument. What it boils down to is this: if God commanded genocide -- as he apparently did according to Deuteronomy -- then he needs to have had morally sufficient reasons for doing so. It is unlikely that he had such reasons. Therefore, the bible cannot be an accurate representation of what God said. As noted in Part 1, the key for the inerrantist is to provide some moral justification of what God did that takes account of what is actually said in the bible. In this post, we take a look at one such attempt from the Christian philosopher Paul Copan. At the outset it must be acknowledged that Copan's discussion is not a response to Morriston's argument but a more general response to the arguments of the New Atheists. The NAs relish pointing out the moral atrocities that are apparently condoned by Yahweh in the Old Testament. These atrocities seem to undermine the idea that Christians occupy the moral high ground. So you can see the attraction. 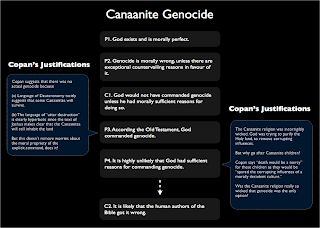 Copan tries to defend Yahweh. One of his key arguments is that any moral judgement we may wish to issue must take into account the socio-cultural milieu of the ancient near east (ANE). The ANE had very different, almost brutal, moral standards. It was, after all, a fallen world. Yahweh and the Mosaic laws offered incremental moral improvement over what was common in the ANE. God was working with the available raw material in a way that respected human freedom and took the first steps on the path to the ethical ideal represented by Jesus. Now questions arise as to why God would choose to do things in this incremental fashion, and as to whether Copan has got the cultural milieu of the ANE right, but we can leave these to one side. The historical relativism promoted by Copan still would not justify God's commanding of genocide. It would not give us the morally sufficient reasons we are looking for. Something more is required. The Canaanite religion was incorrigibly wicked, it had to be wiped out. The language of Deuteronomy seems to tacitly presume that the Canaanites will be around in the future. The "utter destruction" language is clearly hyperbolic since the text of Joshua assumes some Canaanites will survive. God, as the author of life, does not stand in the same moral relation to human beings as we do to each other. He does not owe us our lives; he can take them away if he wishes. He can do this directly (by his own actions) or indirectly (by commanding the actions of others). (2) and (3) are clearly designed to downplay the genocide and so target P3 from Morriston's original argument. They are not successful because they simply ignore the clear command for genocide. (1) and (4) seem like more straightforward moral justifications of God's command. Now, even if God has the right to take away life, as (4) is suggesting, surely he cannot take it away capriciously? He must have some reason for doing so. Thus we are left with (1): the idea that the Canaanites were so wicked that they had to be eradicated. This seems to be the most popular line among biblical inerrantists. It is often coupled with the idea that the Holy Land needed to be purified for the Jews. But why is genocide the only way to get rid of a wicked religion? Why not use the method of rational persuasion? Surely God would not use an inefficient and brutal method where a more subtle and human one was available? What then of the children? Death would be a misery, as they would be ushered into the presence of God and spared the corrupting influences of a morally decadent culture. This would appear the apologetics at its worst. Indeed, after the passage just quoted, Copan goes on to justify other killings as a form of necessary "collateral damage". If any of this is going to work, then it must be shown that the Canaanite religion was irredeemably wicked, to such an extent that genocide was the only option for its eradication. That is a proposition that will be explored in future entries. This is a question begging argument, there is a clear command to commit Genocide only if phrases like "leave none that breath" or references to utter destruction are not hyperbolic. Like Moristion you simply assert the language is literalistic and dismiss the reference to hyperbole on the basis of that assertion. The text is not hyperbolic, at least in the case of the Amalekites. If it were, the story of Saul's disobedience would make no sense. Why would God reject Saul as King for leaving one man and some animals alive if God was only issuing a hyperbole? It isn't until "the days of King Hezekiah" that we are told the Amalekites are fully exterminated, but given so many other inaccurate claims for complete and utter destruction (compare Joshua and Judges), can we really believe that 1 Chronicles 4:41–43 is giving us an accurate accounting of their fate? Perhaps this is yet another exaggeration. I think anyone who goes round-and-round to reconcile these problems will end up making ridiculous claims. Paul Copan tries hard, but he is taking on an insurmountable task. ... and I expect that someone will say God waited over 300 years because of his great patience, but what virtue is patience when it results in killing people for something they did not do? Mr. Danaher, I just came across your blog as I was looking for images for my Art of the Dojo portrait series of BJJ masters. As a Hebrew Bible teacher, this post interested me as it's something I've taught on and discussed a good bit over the years. I think Copan does a decent job, albeit on a popular level, of getting people to see that you can't read the Biblical texts, particularly in genres such as Joshua, in a 'straightforward way' as both Sketpics and Fundamentalists always seem to assume. The linguistic/rhetorical context is just as important as the socio-historical. On an unrelated note, I am coming to train at RGA in a few weeks with my instructor and I can't wait learn from you, as you are one of the best in the art! I regret to inform you that I am not the John Danaher you seem to think I am.